Houston outdoor living spaces like this with a TV and bar area are prime real estate for fans wanting to watch the game during football season. 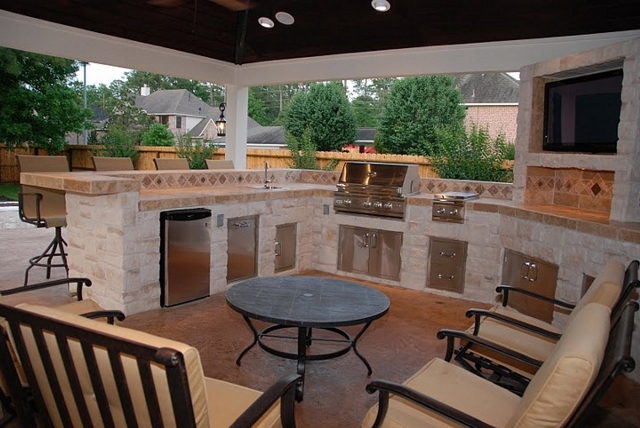 Houston outdoor living spaces enter a precarious time during football season. For football fans, this means gathering around the outdoor TV or media center, enjoying the cooler weather without the hassles of watching the game indoors. For non-fans, however, it can become an extension of life indoors – exclusion from the TV and resident football fans’ time. Whichever group you’re in, we’ve got tips for enjoying your Houston outdoor living design during football season – whether or NOT you’re a fan! That’s why, from now until the end of the football season, Outdoor Homescapes of Houston is offering free installation of outdoor TVs (an $800 value). Those interested in the promotion can contact us for more information. Make sure the TV is in a shaded area (perhaps under an eave), so you can see the screen better. Put your TV in a weatherproof TV enclosure when you’re not using it. Make sure to provide lots of weatherproof, comfortable seating with a good sightline to the TV screen, (this is why it helps to have a professional outdoor space planner like Outdoor Homescapes). Plan for food and beverages. 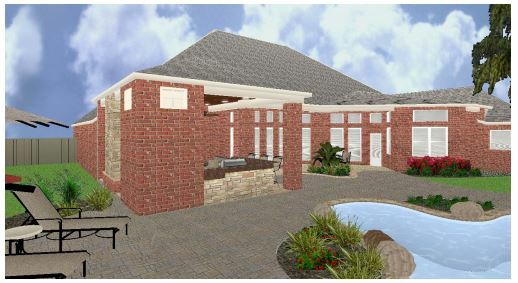 A nearby outdoor kitchen and grill island (also with a sightline to the TV) comes in handy for grilling up steaks, burgers, wings and hot dogs. This island can also house a bar with stools, an outdoor refrigerator for cold beers and even a Kegerator beer dispenser. Offer nightlighting and pathlighting. At the end of the season, it gets darker earlier, and you’ll want guests to be able to find their way around. Outdoor Homescapes specializes in outdoor lighting and nightscaping systems. Banish bugs. You can defend your space by putting out citronella candles, keeping food covered and hanging bird feeders (since birds eat bugs). Outdoor Homescapes also specializes in MistAway mosquito systems. Provide outdoor heaters when the weather gets cold. You can also offset the Guy Factor of your outdoor living space, says Maxey, by adding some feminine touches with outdoor furniture and décor. The Ibiza furniture collection by Restoration Hardware offers feminizing curves. Curved coffee table, decorator pillows and throw by Janus et Cie.
Of course, you may also want to consider just joining the crowd, since NFL statistics show that 40 percent of the football season’s fan base is women.